What makes a phone a smartphone? Officially, there is no standard definition of what makes a phone a smartphone. However, the distinction lies in its capabilities to do more such as being a digital organizer, a music player, an Internet gadget, and a camera, all in one device. These features are expected to come at a cost. For sure, if cost were not an issue, everyone will want to get a smartphone. Jussi Nevanlinna, VP for product marketing for Nokia, sheds some light on smartphones, the Series 40 OS in the 21st century, and a product that blurs the lines between phones and smartphones, the Nokia Asha. “Customers have their own way of defining what a smartphone is instead of us defining it for them. However, we discovered three things that customers expect to see: a touch screen, Web browsing capability, integrated apps and also the ability to add more apps,” said Nevanlinna. Since mobile phones have become a part of people’s everyday lives, several brands have made their mark in the mobile market. A brand known for innovative technology, Nokia launched the Asha phone range which has become a popular choice for those who are looking for basic features found in smartphones. 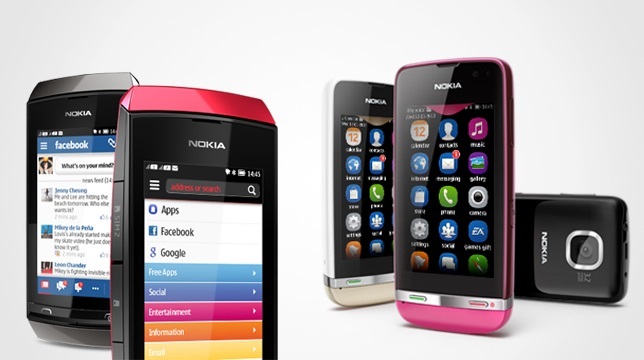 Touch screens are on all the Nokia Asha Touch products, from the Nokia Asha 305 to the Asha 311. With integrated services, the Nokia Xpress Browser is key here, compressing pages by 90 percent compared to other mobile browsers. The cost implications of less data downloaded are important to people who are new to smartphones and who connect to the Internet from their mobile. Nokia Maps are also available on all Asha Touch smartphones. These are the same HERE Maps found on the Nokia Lumia family of smartphones, and users can preload them onto their phone — so there’s no need to wait for them to download when users are on the move. Moreover, the ability to add apps is a key factor for customers. Nokia’s partnership with Electronic Arts provides a big incentive to customers to download 40 games for free. The Asha is a great platform for the growing number of apps found in the Nokia Store. As technology advances, will all phones become smartphones eventually? Jussi said right now there is a growing demand for smartphones and the budget-conscious segment is the fastest growing part of the market. For now, Nokia wants to give the market the best of both worlds: smartphone features for great value at a great price. Speaking of great prices, Nevanlinna provided insight on the costs that go into manufacturing a mobile phone. According to him, the most expensive part of the phone is the screen. The size is usually relative to the price of a phone. Next is memory and storage capacity. The same goes for processor speed and lastly, the quality of the materials used to make the phone. Trust and quality is one of the keystones of how Nokia has shaped the Asha brand and it applies to the Series 40 OS as well. Users have grown familiar with the graphical interface and it evolves to the changing needs of the market. The Asha phone range bridges the gap between feature phones and smartphones. Products like these bring users closer to appreciating the many options that smartphones can offer and soon enough, the budget-conscious market will find that the Asha is becoming a smarter choice for their needs.